The Help Meet Journey: Learning How to be the Housewife & Career women all at once while balancing on my head ! Learning How to be the Housewife & Career women all at once while balancing on my head ! Today I was just thinking and more curious how everyone who seems to be so organized with there household with cleaning, cooking etc... HOW DO YOU DO IT !! ? Me I am still learning and adapting to finding a routine that works for me. I work full time I am a supervisor at winners meaning I work practically everyday. Shifts ranging anywhere from an early morning shift to a late night shift. So I can be very tired or just plain lazy at times :P Recently I would say I've improved though. When my husband and I were first married as in the first month or so ( p.s we are still newlyweds 8 months) I would wine and wine about the dishes and I would get so annoyed with doing them. Now Yes dishes are not my fav but I do them because I love to serve my husband as well as appreciate him. He does the same for me if he is home he will do them for me while I am at work. So I am getting there ! Still what about those days I work 1-10pm!? I am usually exhausted when I get home just want to veg. I Still Struggle with adapting a routine for these days. I get maybe the dishes done in the morning but that's usually it. I am always ambitious and set my alarm for 7:00 am but always seem to only wake up really at 9:00 and I have to catch my bus at 12:00 does not leave much lean way. I lack the discipline and motivation on these days for housework because I know for the next 9 hours of work I will be picking up clothes and cleaning and serving all day. I am Proud to say though that I went from a whining wife to a wife who does love to serve her husband in homemaking when I have the time too :P I am also truly blessed to have personal chef in my kitchen almost everyday , my husband! He Loves to cook he cooks most of our dinners and lunches. He also is a team player when it comes to house work and helps me with the cleaning, so getting the apartment clean is not a problem it is just more I desire to maintain organization and house management , etc... for my husband because I love him. This works for me and I have adapted now to this routine it usually will take me 2- 3 hours! done by 11:30 -12 usually. Sunday I just tidy a little. I am trying and I am actually getting inspired by all these homemaking blogs out there it has shown me it is possible to keep a house organized and clean etc.. while having a billion other things going on Like balancing on your head hehe LOL. Well maybe not literally ! but you get the idea. Writing this blog has also helped to put my life in prospective by digging into the things God desires in me as a wife. I am currently doing the proverbs 31 bible study from GoodMorning Girls.www.goodmorninggirls.org/category/proverbs31/ I am also putting together my own House management binder, to help me stay focused and on track.. I am still struggling with actually writing in it though and sticking to it DISCIPLINE!!! LOL oh I will get it. I find organizing fun and I am good at it when I find something that works for me. WHAT DOES YOUR CLEANING SCHEDULE LOOK LIKE ? WHAT ADVICE COULD YOU OFFER ME IN THE AREA OF HOMEMAKING AND HOUSE MANAGEMENT ? I look forward to hearing from you , especially those wives who have a career! 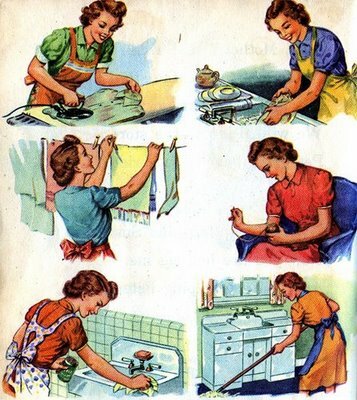 Please pray for me in this journey of Homemaking and learning to stay focused and discipline myself I have a tendency to procrastinate or get distracted when it comes to cleaning ! Hi Lesha! Love your blog. I'm a newlywed too and I also work full-time, so I totally understand the struggle in trying to find balance. What I do when it comes to cleaning is I try to turn it into something fun. I turn on the music and sing along while I clean. Sometimes I even dance a little while I'm sweeping lol. It makes things go WAY faster and it keeps me motivated to clean. I try to clean a little everyday, rather than try to tackle lots of things at once. I'm lucky because I work 9 to 5 so I always have my evenings off ... but if you're able to spend even 30 minutes a day (morning, afternoon, evening, whenever) tidying up a bit it helps.